“Gethsemane: Where the Heart is Crushed” from Christian Faith Publishing author Jimmy Foster takes readers into the garden where Jesus and his disciples spent their last night before the Crucifixion. “Gethsemane” allows readers to experience the “agony in the garden” as though they were there. “Gethsemane: Where the Heart is Crushed”: a revealing look into the place where faith is tested and God meets His Children for healing. 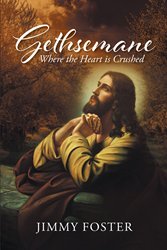 “Gethsemane: Where the Heart is Crushed” is the creation of published author, Jimmy Foster. Jimmy is an ordained Baptist minister with over forty-one years in the ministry. He authored “In the Upper Room: Facing the Trial of Your Life.” He makes his home in the beautiful North Georgia mountains. Published by Christian Faith Publishing, Jimmy Foster’s new book explores the significance of Gethsemane. Gethsemane is a place that has been shrouded in mystery. It is at this place that one of the most monumental events in history took place. It is the place where faith was tested. Sadly, Gethsemane has become such a fundamental part of the passion narrative that few realize what exactly transpired there. “Gethsemane: Where the Heart is Crushed,” author Jimmy Foster walks readers into the garden on night before Jesus died. Once there, readers will see the suffering that the Son of God endured. They will see things that would distract Him from fulfilling His plan. They will hear the resolution in His prayer. They will realize that someone has walked the path of suffering before them. View a synopsis of “Gethsemane: Where the Heart is Crushed” on YouTube. Consumers can purchase “Gethsemane: Where the Heart is Crushed” at traditional brick & mortar bookstores, or online at Amazon.com, Apple iTunes store, or Barnes and Noble. For additional information or inquiries about “Gethsemane: Where the Heart is Crushed”, contact the Christian Faith Publishing media department at 866-554-0919.